Many corporate travellers use limousines for RDU airport transportation when they are visiting for business events. Raleigh Limousine and Party Bus rentals provides luxury vehicle services that enable our clients to reach the airport in style and on time. Our airport limo service takes care of the elaborate details that business and recreational travellers want in their vehicles. 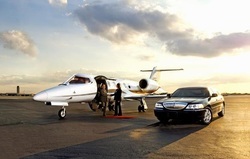 Our luxury services help our clients in reaching the airport at the assigned time with a comfortable riding experience. There are many limousine companies in Raleigh that provide airport transportation RDU limo services but our company is one of the few car rental companies that put a priority on exceptional customer service. As we run on a tight schedule, it is important that our clients contact us a few days prior to the flight so that bookings can be easily confirmed with our RDU limo service. Our drivers are prompt and punctual to reach the accommodations that you may stay at. Our biggest efforts will be made toward ensuring that the facilities that are needed in the car are present according to the preferences that are specified by our clients. Why Choose Us for RDU Airport Transportation Services? We provide the most affordable car service from Raleigh Durham airport with the highest quality vehicles to our clients. For our company, delivering time efficiency for our clients is an important factor that we take into consideration when making our route strategy. We keep a vigilant check on the customer’s schedule to know the arrival and departure times, as well as any delays, for their flight. Our employees adjust driver’s timings according to the flight schedule of our clients. Our drivers make an effort to take routes that have lesser traffic for a smooth, comfortable, efficient ride. Raleigh Limousine and Party Bus Rentals interacts with our clients regularly to find their traveling preferences. We ask for a detailed account of our client’s travel plans so that their travel schedule is not disturbed. Our team confirms the client’s schedule diligently to avoid any last minute interruptions. To combat any interruptions in traveling, our drivers are fully informed about other travel routes to Raleigh–Durham International Airport. Some clients may prefer to know about the travel routes in advance. We can provide that information when the order has been booked and confirmed. Our drivers and maintenance staff keep our cars in excellent condition for our customers. We offer the best car service Raleigh Durham Airport has available. Our goal is to provide our customers with the best limo rental experience in Raleigh, North Carolina. Our company has the required licenses and certifications that are needed for an efficient driving service. We are always diligent to check our limousines and party bus’s internal and external parts to ensure maximum safety. Cleanliness and safety inside our limousines and party buses are a large part of our effort to make our client’s journey easy, relaxed and a cut above the rest. call us & book the highest quality airport limo service Raleigh nc has to offer!